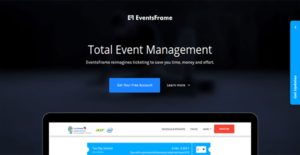 EventsFrame is an event-ticketing system with an intuitive interface. It supports unlimited free and paid events and is a cost-effective application as it does not exact per ticket sale fees. This makes it an attractive solution, especially for solo organizers and small organizations. Also, EventsFrame has a multifunctional dashboard. This is where organizers can create events and arrange tickets by dragging and dropping them across the window. Other than that, the application’s dashboard is where users can find relevant information regarding their events such as the number of participants and the amount earned so they can evaluate the success of their affair. With EventsFrame, organizers can make their events more attractive not just by marketing the benefits of participation, but by offering diverse types of discounts. They can combine these, too, to further encourage their target audiences to buy their tickets immediately. And to facilitate smooth payment processing, the application integrates with two major online payment gateway services and even supports wire transfers. Organizers do not need advanced IT skills to create and manage events. With EventsFrame’s intuitive interface, setting up an event takes only a few seconds from the dashboard. Once all the necessary details are included, users can drag-and-drop ticket types across the screen. Sometimes, there are events that have follow-up affairs such as dinner parties or even pre-event meet-ups like workshops. Instead of arranging those as separate occasions, organizers can now offer sub-tickets to interested participants. This is triggered once the buyer has selected the main ticket and is to be offered as an optional purchase. This makes the events dashboard more organized and tracking related happenings more efficient. One way organizers can encourage their target audiences to sign-up for their events is to offer discounts. With EventsFrame, they can do this with ease as the application allows them to create multiple types of promotions and even bundle them together for combination discounts. This can especially be helpful in case there are events that have sub-events. Instead of requiring ticket buyers to pay the costs at partner establishments, organizers can let them make their payments online with EventsFrame. This is made possible by the application’s tight integrations with Braintree and PayPal. Through these online payment portals, eventgoers can rest assured that their financial details are protected before, during, and after transactions. Additionally, organizers can also offer a wire transfer option. This is beneficial to ticket purchasers who prefer not to keep any of their financial information in any gateway on the web. Moreover, users can employ either PayPal or Braintree to send invoices to clients. Or if they wish, they can synchronize other invoicing systems with EventsFrame. This way, they can monitor payments that have been made and those that have yet to be completed to ensure that they do not incur bad debts. One of the first places target audiences go to when searching for an event is its website. To make ticket purchases more expedient, organizers can embed the EventsFrame widget to their websites. This way, customers can easily buy and pay for their tickets without having to go to another website. EventsFrame enables organizers to get a clear overview of their past, current, and future events through its multi-event dashboard. This section shows them information depending on their configured filters for them to determine how well their events have performed or are performing and whether they can expect a good show of attendees for their future happenings. More than that, users can export events data in the form of CSV files to Excel or Google Sheets for easy information sharing with stakeholders. What Problems Will EventsFrame Solve? The next step in setting up an event is crucial. The promotional phase is when organizers have to vigorously attract their target audiences and to encourage them to buy tickets. With EventsFrame, they can do this effortlessly as the application supports different types of discounts such as the Early Bird Discount that can be used during the advanced selling efforts. This can even be structured in a way that a specific number of people get 30% off while others get 20% off and so on. As such, organizers can make their events more attractive to companies or groups that are sending several of their people. Most organizers do not supervise just one event at a time. To facilitate non-strenuous management of multiple happenings, EventsFrame provides users with an easy-to-use dashboard where they can view attendee and revenue statistics of events occurring in their immediate local or national vicinities and even those that are set abroad, whether they are one, two, or ten events. Also, reports generated by the application can be exported as CSV files that are viewable in programs like Google Sheets and Excel. Pre-conference, the actual event, and post-affair tickets. It can be a challenging and arduous task managing different ticket types for related events and can make registration pages cluttered and complex that interested participants would not know where to begin. But with EventsFrame, organizers can simplify the registration processes for these related affairs by bringing them all under one page. The application facilitates this by nesting sub-event tickets under main event tickets. For example, entrance coupons to a post-conference dinner party are only made available to those who have or about to purchase vouchers for the main event. If you are considering EventsFrame it might also be a good idea to investigate other subcategories of Best Event Management Software listed in our base of SaaS software reviews. It's crucial to note that hardly any service in the Event Management Software category is going to be an ideal solution that can fulfill all the goals of all business types, sizes and industries. It may be a good idea to read a few EventsFrame reviews first as certain software can dominate just in a very small group of applications or be created with a really specific type of industry in mind. Others might work with an intention of being easy and intuitive and as a result lack advanced features welcomed by more experienced users. You can also find software that focus on a large group of users and give you a powerful feature set, but that in most cases comes at a more significant cost of such a service. Be certain that you're aware of your needs so that you buy a service that offers exactly the features you search for. How Much Does EventsFrame Cost? We realize that when you make a decision to buy Event Management Software it’s important not only to see how experts evaluate it in their reviews, but also to find out if the real people and companies that buy it are actually satisfied with the product. That’s why we’ve created our behavior-based Customer Satisfaction Algorithm™ that gathers customer reviews, comments and EventsFrame reviews across a wide range of social media sites. The data is then presented in an easy to digest form showing how many people had positive and negative experience with EventsFrame. With that information at hand you should be equipped to make an informed buying decision that you won’t regret. What are EventsFrame pricing details? What integrations are available for EventsFrame?